OMG! I can’t believe I’ve done it! 21 days of regular yoga and a little blog about it each evening. Now I’ve reached the end I can’t wait to have a lie-in tomorrow and not feel I have to scroll through my HUGE (like, so much more than any one person needs) yoga library to find a 10 minute session to follow. I do not think that this has become a habit as I had hoped. In fact, my shoulder injury (which I got from yoga a couple of years ago) has been niggling me again and I am really looking forward to having a break. So today, instead of doing my planned Ashtanga video, I used a new DVD I got from Yoga Matters in the January sale. It is called ‘Yoga Link: Shoulder Shape Up’ by Jill Miller which gave some great yoga exercises specifically for shoulder strength and mobility and described them in detail so they weren’t too scary. I would definitely recommend this DVD if you are having any shoulder issues. She also has a ‘Core Integration’ DVD which I have used in the past and it gives some interesting core strength exercises which are specifically yoga related rather than being a watered down Pilates set as many of these hybrids can be. Anyway, I just wanted to let my regular readers know that I intend to post again tomorrow (in spite of my idea for a lie-in) because the one habit that has caught is to blog more regularly. I hope you’re enjoying my thoughts. If you have any thoughts of your own on these past 21 days or what you’d like me to talk about next please let me know in the comments below or on Facebook. I totally forgot to start this a day later than planned so it would actually end on Leap Day. So maybe that means I’ll have to extend it by a day! Anyway, today’s practice was short but sweet. A nice little flow courtesy of an old DVD Chris got me when he worked at HMV. It is called ‘Beyond Dynamic Yoga’ by two English people – Annabelle Purnell and William Robertson. It is a strong ashtanga vinyasa sequence but it starts with an unusual warm-up to improve strength and stamina and that is what I did this morning. The DVD came out in 2001 and I have owned it since 2004 but had forgotten about how good it is. I am so glad to be doing this challenge as it has forced me to dust off old DVDs and rediscover the classics. Hidden under this one was John Scott’s Ashtanga DVD which I might attempt tomorrow! We’re getting close to the end of this challenge and so I went back to my current favourite teacher Sadie Nardini and did a workout from her teacher training (which I am currently studying). I can’t show you this (apart from in class) so will direct you to her Youtube channel instead. There you can find all sorts of FREE workouts to fire up those core muscles and develop physical and mental strength. I had a pyjama day today! 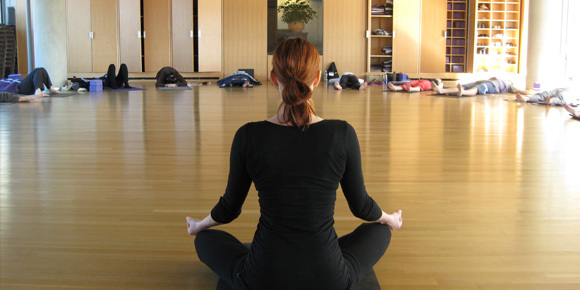 I caught up on some episodes of medi-soaps ‘Grey’s Anatomy’ and ‘Private Practice’ and did an old faithful yoga session this morning (well, afternoon really, but who’s counting?) – from ‘Inhale’ with Steve Ross. This DVD was downloaded for me years ago by my friend Jane who teaches yoga in Banbridge. Just before she gave me the DVD I had bought a book by the very same man! 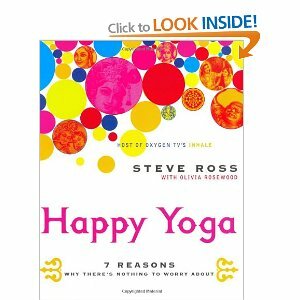 ‘Happy Yoga’ is one of my favourite books and I actually love his philosphy more than the asana pratice in it. That said, his practice is good: a challenging flow sequence with lots of down dog splits and some very happy practitioners who seem to have had too much Red Bull. Good sweaty fun that really cheers me up although I had to change my pyjamas once I was done!